Description - Guitar Duo playing hits from the 60’s to present day. 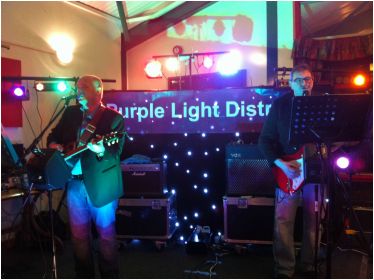 The Blue Bell will be opening the Sixth Gretton Music Festival with Purple Light District, a guitar based duo playing hits from 1960’s to the present day. Andy and Nick have known each other for nearly 40 years and started playing in bands together way back then. Nowadays, they are a much in demand duo playing around Northamptonshire, sometimes further a field, in local pubs and clubs. They bolster their sound via high quality backing tracks all played through a state-of–the–art BOSE PA system. They play sets comprising of easy listening tunes, heavily influenced by The Eagles, before cranking it up by playing songs from the Monkees through to the Stereophonics and everything in between. Blue Bell Contact 01536 770404 Email: bluebell.inn@btconnect.com"